Hidden in a quaint fisherman’s cottage down the iconic Lanes overlooking Market Street is Giggling Squid – simple, fresh Thai food at its best. This is one of sixteen in its group across the UK, and with a £6.4m funding secured from Business Growth Fund it won’t be long until their portfolio expands even further. So What’s Different About This Thai Restaurant? 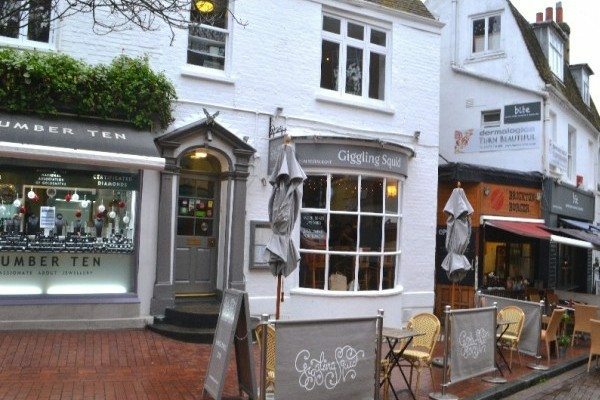 If you’re shopping down the narrow lanes looking for a mouth-watering lunch or desire a delicious evening meal, this restaurant is perfect for both and a popular choice for special occasions. As you enter through the door you will notice the narrow walkway of the cottage. The rooms are softly lit, and furnished with rustic wooden décor, and grey painted walls. It’s a theme carried out in all of the chains, which gives the restaurant a real stylish, intimate feel. It has three rooms in total, with a larger room upstairs which can be used for private functions. We sat downstairs in front of a large pane window overlooking the square. Although it had just hit 12.30pm, and we had not booked, we were seated straight away and made it in good time before the busy lunch period began. 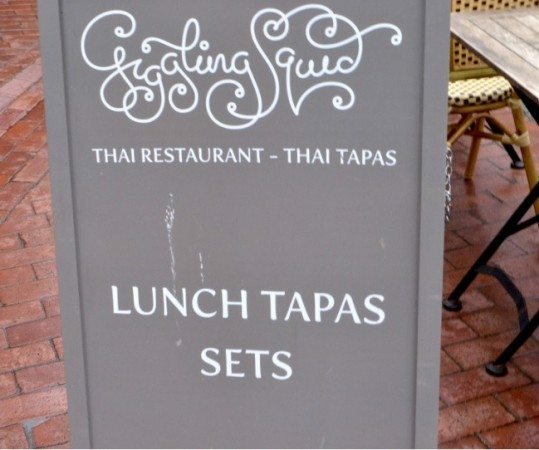 Their Tapas lunch menu is what makes them unique, do you ever go to a restaurant and fancy a bit of everything? 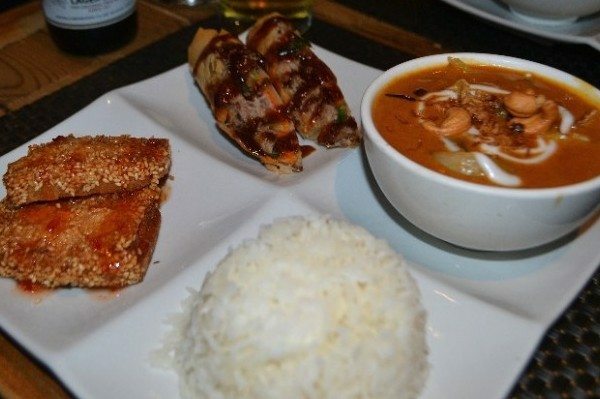 With their Thai tapas you can select from six different sets, each set includes four different succulent dishes. Don’t be alarmed, it is not four separate dishes on four plates, It is beautifully served on one square white plate split into four easy to manage sections – perfect for a light but satisfying lunch. I chose The Wealthy Squid tapas which includes Lamb Massaman Curry, Shredded Duck Spring Rolls, Jasmine Rice and Prawns on Toast. Whilst we waited, we ordered a Singha beer pronounced Sing-ha. This pale lager labelled with a powerful mythological lion, found in ancient Hindu and Thai stories was once the best selling beer in Thailand and is still very popular choice in restaurants today. This is one of my favourite beers, and it complements the food beautifully. Where to start with this dish!? It’s a sensational experience combining all my favourite flavours, taking me back to Thailand where I first discovered the delicious taste of real Thai cuisine. The Prawns on Toast with sesame seeds drizzled in sweet chilli sauce were bite size pieces. The delicious smell from the Shredded Duck Spring Rolls was immediately appetising. They were also sliced open, so you could see the meaty filling lightly coated in Hoisin sauce dripping out. They were crisped to perfection. 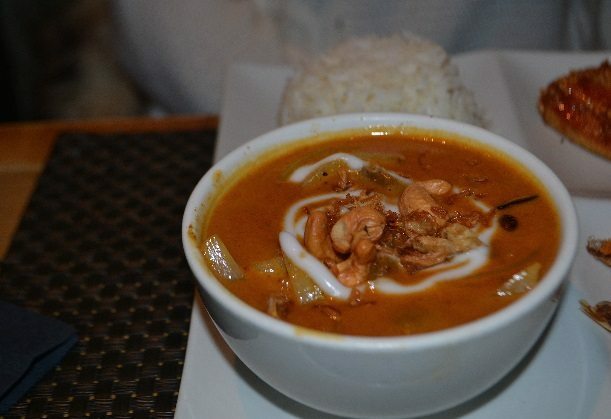 The Lamb Massaman Curry decorated with cashew nuts and dried onions is rich in colour and creamy in texture. The Lamb was very tender and succulent and the flavours came through gradually, from ginger, to star anise, and coriander mixed with the soft new potatoes and carrots, which makes a fantastic combination. The rice was well cooked and the Jasmine just added that little extra flavour making it a perfect side with the main. I decided to opt for the vegetarian set tapas. I think a true testament of a flavoursome dish is a meat free option. This set includes vegetable Thai green curry, stir fry vegetables with ginger, Thai spring. The food arrived very quickly – I was drawn to the aesthetically pleasing vibrancy of colours arranged beautifully on the plate. 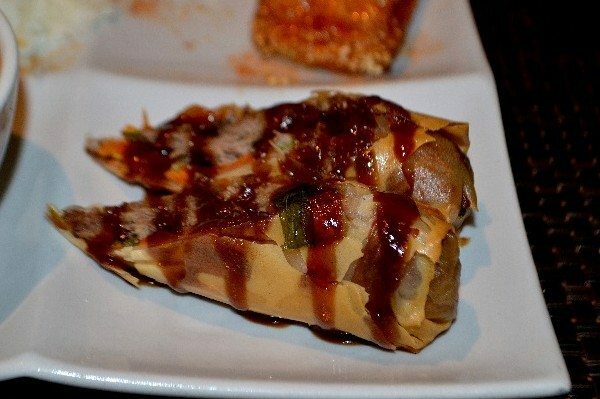 I started with the spring rolls, drizzled in a fragrant sweet and sour sauce and cooked well – with just enough filling and just enough crisp. 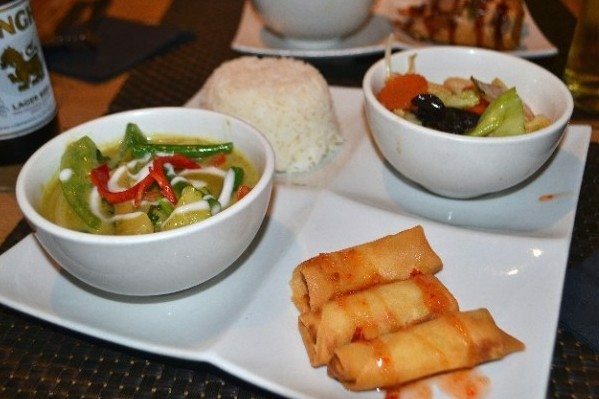 Usually you eat the spring rolls as a starter, but having the choice of mixing them with the main was a pleasant alternative. The Thai green curry tasted as good as it smelt – with a creamy consistency among the crunchy mix of courgettes, broccoli, green beans and peppers, with just enough kick of spice! The tofu was cooked just right (it’s quite rare for me to say that) but the texture had soaked up the green curry spices well making it a winning alternative to meat. 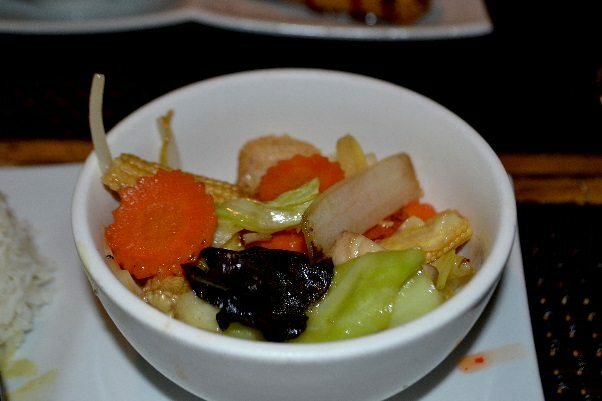 The stir fry didn’t look as inviting, but the flavoursome ginger among the carrots, onions, mushrooms and stir fried crispy veg made it a simple yet tasty addition to the dish. We really enjoyed the combination of four options on one plate without having to order separate dishes. Giggling Squid offers a fuss free experience where everything is put together for you ¬– where each dish is made to complement the other. After finishing, we were left full and satisfied. The portion size was perfect for a sit down lunch option, and equally you get your money’s worth. We initially thought eating a Thai food lunch in a very British fisherman’s cottage would feel slightly unnatural, but the fusion and ambiance encapsulates the Brighton charm we know and love. The resounding attention to detail, service, and most importantly the food made the overall experience an enjoyable one which we would highly recommend to any foodie. We would advise booking tables if you are with larger groups because the restaurant has limited seating, and can fill up quite quickly!